Well, since barely anybody else has sewn this pattern (Burda Style 7221), I thought it only appropriate that I sew it twice (first time sewing a pattern more than once!) 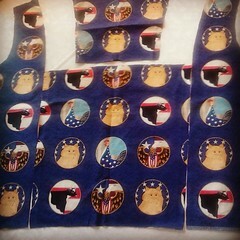 I made version B, the tank top. To see version C, the dress, go here. The upper bodice is a lightweight quilting cotton and the lower bodice is a striped silk in different textures that I purchased at a thrift/op shop. I loves me a thrift store and always find such sewing treasures there! (I’ll be writing a blog post on my haberdashery and sewing book thrift-ed finds soon). I used the same front and back upper bodice pattern pieces that I used for the dress version. I had already altered them before sewing the dress, so I ‘knew’ that it would fit. Right?? WRONG. When I sewed the upper part in the quilting cotton, I did not take into account that it had a vastly different drape, hand and thickness than the white rayon-blend fabric used for the dress, and the fact that this version was sleeveless. And… it did not fit. At all. The neckline gaped considerably in the front and back (forgot to snap a pic, sorry). Thing is, I had already completely sewn the entire top (and it is self-lined) so altering it became something of a creativity contest. This is what I did: I added a long dart in the centre front and centre back, ending at the seam that attaches the lower bodice. Then, I pressed the darts open, not to the side (without cutting them first, so that everything was still finished off inside). I then hand sewed the top of the darts to the bodice. It worked beautifully! Who knew? Although, it may have slightly altered the straightness of the empire waist seam. Since the darts extend the length of the upper bodice pieces, it looks like a 2-piece bodice with CF and CB seams. I sewed darts into the CF and CB, then pressed them open. How would YOU fix this fitting issue? What would you have done? What would the sewcialists / spoolettes do? (#wwtsd) (Besides, of course, the obvious of re-fitting before sewing). What is your favourite fabric to sew with and why? What is your favourite fabric to wear and why? (They can be the same fabric or not). I’d love to get an idea of who is sewing with what, discover any fabrics I may be missing out on and perhaps I will even generate a chart (CHART!!!!) with the results. Thanks for playing! OOOOOOOH, I GET MUCH BETTER CELL PHONE RECEPTION IF I MOVE MY GIANT HAT LIKE THIS!! Thank You Brooke! Ah, okay, so you mean make the armhole curve larger? Would this then take more fabric out of the front and back neckline, reducing the gape? The straps (I think they call them rouleau) are also joined around the armhole, then extend up on either side. (I probably should have mentioned that part in the blog post). That is also why I didn’t take it in at the sides as I’d have to remove the (hand sewn) and textured silk straps from the armhole (I was afraid the unpicking would have destroyed the fabric). French inventor of the jacquard loom (1801), the first automatic loom able to weave complex patterns. 1. A fabric with an intricately woven pattern. 2. A special loom or the method employed in the weaving of a figured fabric. This looks great. You cannot see the darts at all on the finished top. Unfortunately I am tempted to answer that my way of fixing this would be to give up 😉 My favourite fabric to sew with like you is 100% cotton (not glazed or too fine). My sewing machine only really likes cotton and fleece. It will and does sew other stuff but only under protest (even if I change the needles and tension and everything). If I could make all my clothes out of quilting cotton, I would. Realistically, this would result in some strange stiff clothes that wear out quickly, but a girl can dream! Yes, luckily, I colour-blocked the top with different fabrics, so ending the darts at the wider, and more swingy silk fabric allowed it to look like a 2 piece upper bodice. I think if I’d had to extend it all the way down, it wouldn’t have looked as good. I know what you mean about sewing with cotton. 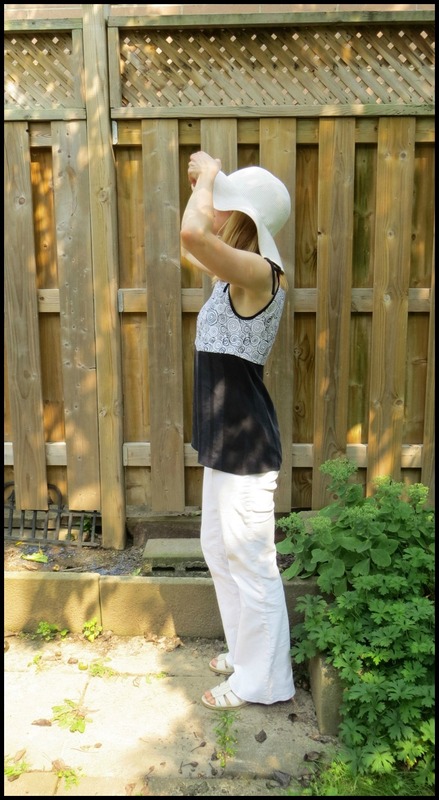 Many of the clothes I like to wear, the cotton does not work well at all for, (I prefer more skimming, flowy shapes and not so much fitted), but to sew with….so easy to do!! 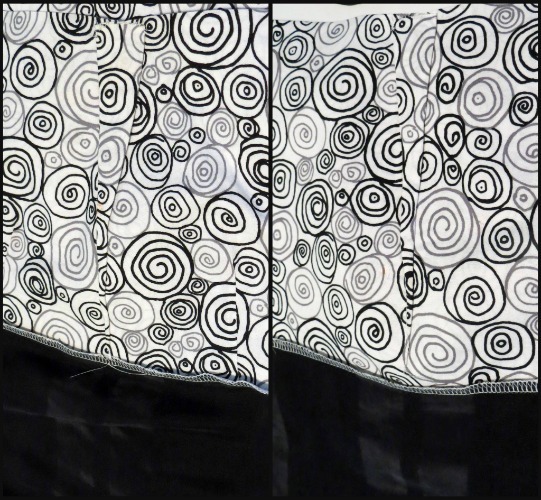 My favourite fabric to sew…soooo many! Probably a lightweight cotton. I love to press! I also like stable knits. I prefer wearing cotton. I love natural fibres. I haven’t tried sewing silk yet, but the day will come. Your outfit looks amazing! Thanks Janet! I much prefer stable knits to the tissue thin ones. Usually I end up with a hate-on while trying to sew these types of knits, although they do feel nice and light and breezy while wearing them. 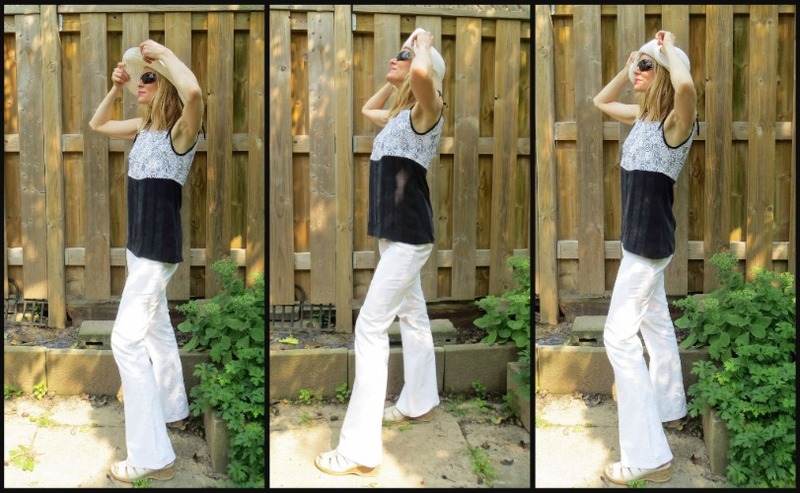 The black fabric of this top was silk and was actually textured, so some areas were very, very thin, but it was actually very easy to sew with! Keep in mind though that the bottom bodice is not fitted or shaped and then I made bias strips for the armholes and straps with it. Sewing a complicated shaped pattern with a thin silk would certain be much more challenging. Just start with a simple shape and use your silk with that for your first project. Ooooh, so now, of course, I have to ask, so how come you just discovered the sheer joy of sewing with cottons and wool? Wool is nice and stable, but I find it a bit itchy to wear, depending on the texture. And, sewing with silk chiffons? Wow, brave you!! I love your top, it’s so pretty. I think your adjustment was the perfect solution – it is perfectly acceptable to have a centre front and centre back seam. Thank you Sandra! Yes, I didn’t realize till after I’d sewn in the darts that they just looked like CF and CB seams, and was pretty happy with it! Stretch cotton sateen is wonderful, isn’t it? Has a lovely sheen to it, nicer than plain cotton and of course the stretch, so forgiving for fitting and wearing. I just received some NZ merino from Kat and Mel a few weeks ago! Can’t wait to sew with it. Any pattern recommendations for it? (They are both striped fabrics so keep that in mind). Nice fix – your top looks great! I probably would have unpicked the whole thing and recut it. That, or given up. I like your method better! My favorite fabrics right now are linens that aren’t too shifty and many kinds of twills. Thanks Morgan! I couldn’t stand the thought of unpicking everything especially since I made the bias straps out of the textured silk and especially in the thinner parts, it was so delicate, I knew it would just tear as soon as I tried to rip out a stitch. Linens, you say? I like the way linen sews, but am always nervous that it will wrinkle and look bad by the end of the day. But, in reality, I think it only seems to be SOME linens that do this. Not sure of what the difference is, but even in RTW, label will say linen, some wrinkle just by looking at it and some, still fine by the end of the day. ?? The fit is beautiful! I think your solution to the problem is the best, since it improves fit as well. Not sure what I ‘d have done… I guess taking in from the sides. The double ties and binding are a great accent. My favorite fabric to sew… since I haven’t been sewing recently and don’t have experience with lots of different fabrics maybe linen? And for wearing, I think rayon jersey and rayon (viscose) for shirts and dresses, and cotton and linen for pants. Not sure when to say rayon and when to say viscose. Thanks Elise!! I thought about taking in from the sides, but since the silk bias binding goes around the armholes and then extends up for straps, i would have had to unpick that first, and (well, not only did I not want to, LOL), but the fabric was too delicate to withstand a good unpicking. To sum up, looks like viscose and rayon are manufactured in the same process but different materials are used for each. Viscose is usually less durable than rayon, as well. This is cool, I was not sure of the difference either! Thanks for finding that info! I’m surprised they say viscose is less durable, but maybe rayon is extremely durable. A down side for me is that it is prone to silverfish 😦 Otherwise I find my viscose garments last very long and I even tumble dry. Thank you Kat! And, the fix is holding well, I wore it all day and nothing weird happened, no bulging or gaping or other such ‘oooopses’. Natural fibres are the way to go, aren’t they? I love to sew with linen, but know what you mean about the creasing. I was just telling Morgan in a comment above, that some linen wrinkles when you just look at it, and others seem to be okay, even after a day of wearing. I’ve no idea why this is? Different way of manufacturing it? Coatings? I love your top, great that the fabrics were thrifted too. I always feel good wearing a treasure made out of someone else’s throw-aways. Thanks Louise! I am mildly addicted to shopping at my local thrift shoppes. They almost always have the greatest sewing stuff and the money goes to various charities. Win-win! oh this is good stuff! I love a new way to make a favorite. I like to sew and wear challis- great body and swish to it. Challis baby!! A classic. You know, until I began blogging, I had never heard of challis. But, I love the uber flowyness of it. Like you are always Marilyn Munroe on the subway grate, but since the fabric is so flowy, you don’t need the subway grate wind! (darn,,,,, pressed the enter button before finishing post)….. but i have to admit I do wing it quite a bit and alter as i go along. As you say, different fabrics react differently and you just can’t tell. Nice job tho. cute top. Lol, I call that “premature sending”. Yes, I often will alter the pattern before I cut it out, but then do a lot of tweaking along the way. The unfortunate part of this one was that I was completely finished (thinking that I had sewn it before as the dress version, so it must fit) and then…..didn’t. So the alterations had to be a tad more creative. Also, wanted to ask if you could let us know what is your favourite type of fabric to sew with! Thanks Daisy! Yes, cotton is a big fave for sewing, for sure! “Cutting silk is like trying to cut water!” Hahahahaha! Ain’t that the truth! The silk for this top (the black fabric) was actually surprisingly easy to cut, I guess it did have some body. I made a 1920s/30s style jumpsuit ( https://gjeometry.com/2013/06/04/great-gatsby-make-the-cats-pajamas-one-giant-leap-for-womankind/ )out of a ridiculously thin viscose challis and it actually made me cry, trying to cut it! Would not stay still and even when I pinned it to the board, it still managed to move away from my scissors. Looked like a 3 year old had cut it! Your blouse is just lovely! You can see from the pics, it looks like it definitely has more of a sheen and slipperiness than my black silk, so would make it much more difficult to cut and sew. .
I’m with you on lightweight quilting cotton! I love to sew it, and it usually comes in totally mind-blowing prints, don’t ya agree? I also LOVE those stretchy lightweight sateens, both for wearing and sewing. I love to wear knits, but I feel way more sophisticated in wovens… Well, if you’re such a fabric whore as am, you love them all, what can I say?! You have another lovely make from that patten. How did we all overlook that pattern? I love sewing up cotton fabrics (batiste, broadcloth, poplin, flannel, even voile). Wool suitings run those a close second. 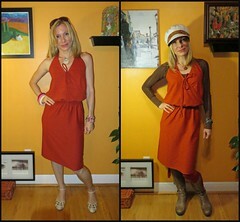 For wearing, though, my absolute favorite fabrics are cotton/lycra jersey fabrics. Rayon challis is probably my second fav to wear, at least in summer. Thank you Cari! I think sometimes it’s a bit about what is popular in the sewing pattern world and I think this can overtake the rest. Also, I think folks seem to be liking the more 50s style of tight, fitted bodice and full skirt, which is such a cute look, but I do not like it on me, I think too much fabric on my person, and I don’t feel too comfortable in a tight/fitted bodice unless it is a knit. Nor do I feel it fits in with my lifestyle. (I can’t help it, I just feel like I’m in a ‘prom dress’ in this silhouette at work, lol, although I do wish I had places to wear dresses like that). And, oooh, first vote for wool suitings, but I can see why! I made Gertie’s portrait blouse in a lightweight wool suiting and really like it. It’s not just for suits after all! And, yes, how can you argue with wearing a soft, pliable knit fabric? Always a fave. My guilty pleasure is cotton sateen. I love it’s stretch, ease of sew and sheen. So good! Thanks Amanda! I SHALL PERSEVERE!!! 🙂 You are, I think, the 4th vote for stretch cotton sateen. I can totally see why. Yes, to all the reasons you mentioned!! Really nice looking top, a great fabric combination. Thank You Jay!! I wasn’t sure if the stiffer cotton would go with the very thin drapey silk, but because of the cut, it worked in the places I put them. Do you have a favourite fabric to sew with? Cotton – especially lawn and voile. Love the way they take stitches and press beautifully. Knits…. They are so comfy, except for ITY – the ITY’s I’ve sewn with were very sticky/sweaty to wear. eewwww! I love the tank top!! It sounds like you found rather easy solutions for a few of the problems you had with the pattern, and I’m glad! I know what you mean about quilting cotton. I used it a few times and it’s SO EASY to sewing with, but then, at least for me, I was so disappointed when I put it on. I tend to buy jersey, rayon, silk, and cotton blends for the most comfortable and best looking finished objects. That said, they’re not always so easy to sew with! Thank you Kristin! Yes, the fix really didn’t require a lot of song and dance to work. ‘Jersey, rayon, silk’, yessss! Love all of these. I don’t know that I have a favorite fabric to sew, but I really don’t love polyester. As far a fabric to wear, silk is fabulous, but so is wool. I know what you mean about polyester. I’ve had some trouble with it in the past, but my mum brought me some absolutely gorgeous chiffon crepe (100% polyester) and I’ve been researching ways to sew it more easily. 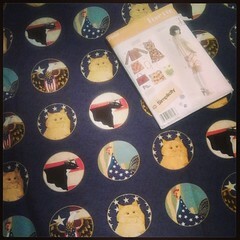 I will post the information when I sew up the fabric. Thanks Rachel! They are taken in my backyard and with my new (to me) tripod that I got at a thrift shop! I think that wool is the best thing to sew with because it is flexible and can be manipulated and shrunk. It tends to absorb little mistakes. And a good dense cotton would be a close runner up, with linen pretty darn close. But to wear I have a fondest for silk. Looking forward to the chart as none of seems very keen to follow you strict rules! Hi fabrickated, thanks so much for voting! Yes, I’ve sewn with wool twice before for a top and trousers and I have to say, it really sewed up and stayed where I wanted it, no slip sliding away and you can shrink out the hems so easily! Nice choice. And, who doesn’t like wearing silk?? I haven’t had trouble sewing with woven cotton, cotton/linen or wool. So I don’t have a specific favourite. I like wearing those three as well. I also like wearing rayon, but that can be a touch trickier to sew. I don’t like sewing (or wearing) polyester or other synthetics. Your top is lovely -I”m happy to see it turned out well after all the frustration. Thanks for your compliments! Those 3 picks are definitely winners for both sewing and wearing. I’ve had many ‘fights’ with synthetics before, even though many of them now feel nice to the touch and have a good drape, they still seem to argue with the sewing machine a lot more than natural fibres. Loved the Aug post, particularly the changing Art Gallery with the outfit. Lots of effort. I would guess that a lot of people wouldn’t be able to wear this dress which is why it hadn’t been sewn earlier. As to my fav fabric to sew, silk. yes, it takes weights and rotary cutter but it is so nice to sew and wear. The various types of silk and textures do call for different treatments. I also love Chanel type wool suitings with various fibers. This week’s project, crepe-backed satin with lace overlay for a wedding in two weeks. Aw, thanks Elaine, good to hear from you! (hee, I’m so pleased you noticed the changing artwork. 🙂 ) Silk?? It’s lovely to wear but how brave of you to chose it as your favourite to sew! You are a pro, my friend. Your project sounds lovely, hope it turns out well. Very cute Catja and I’m loving the two tone as well. the spagetti straps are casual looking, while the fabrics are a little more polished. I always like that in clothing. Simple lines with polished fabrics is so elegant. All the designers I like often follow the edict. I always think of Grace Kelly or Angelina Jolie. Both were/are masters at wearing well made, less detailed/fussy clothing well. Thank You Kelly! So sorry, it took me so long to get back to you, but Kitty got sick. 😦 He had to go into hospital for 2 days. Then, sadly, after a day of being home, he got sick again and back to the vet. Got some treatment and came home. THEN, believe it or not, got sick again and had to go into vet for a 4th time! So, I was just beside myself! He is doing much better now, although I have to watch him and his diet.